A momentous day in our kitchen. The first time we’ve made wonton pastry. 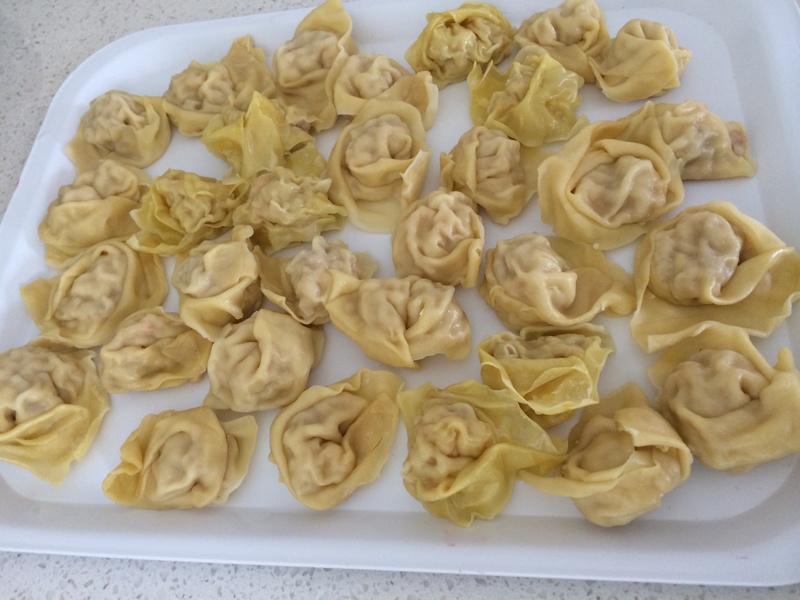 We all love wontons and having worked in a Chinese restaurant in school holidays as a teenager I remember rolling these by the hundreds but never made the pastry myself. With miss 14 home from school we rolled up enough for afternoon tea and dinner. Definately a great job to share with the family otherwise very time consuming. The recipe is so simple: based on a recipe from A Taste of Asia and adjusting recipe to suit. Add all ingredients to TM bowl, Mix a few seconds in speed 3. Then knead on dough mode 1 minute. Leave to rest for 30 mins. 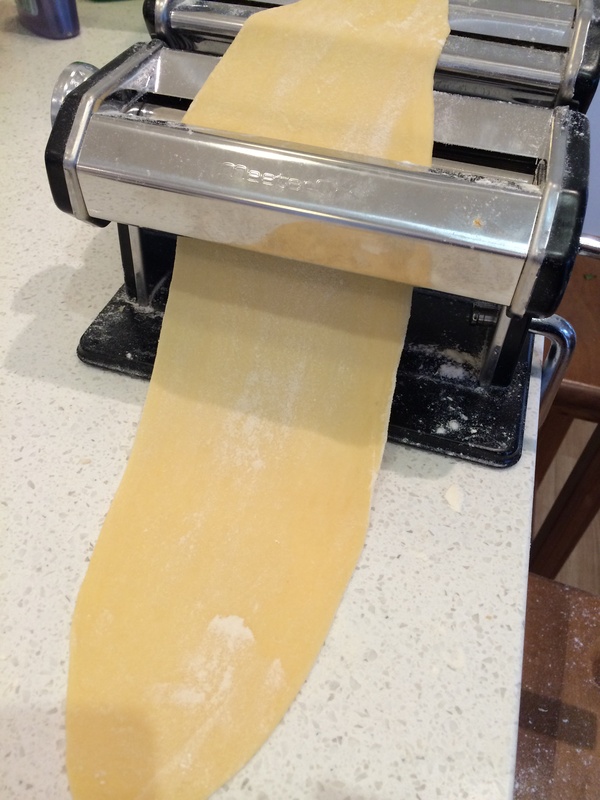 Roll out to thinnest setting on the pasta machine. Make the filling with prawns and chicken – used the recipe link below but reduced fish sauce and oyster sauce so they weren’t too salty, the white pepper gives them wonderful flavour. Put a small amount of the filling on the wrapper and roll into wontons. Place in Varoma dish and steam 20 mins, Varoma temp, speed 3 with a 1000g of water in TM bowl. ( sprinkled a little water on them to moisten them before steaming ) can be refrigerated or frozen at this stage. Made soup using TM chicken stock and added some vegetables. 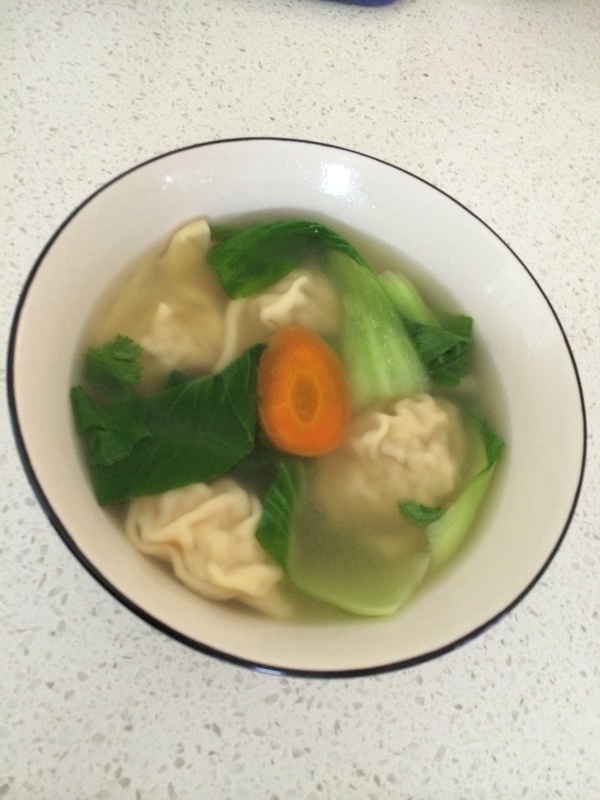 When ready to serve add wontons to the soup and reheat. Serve with sesame oil, spring onions and soy sauce to taste. Perfect for snacks, lunch, dinner and can be served with a dipping sauce. NB The pasta roller has to get to 1, the thinnest setting, We missed the last quarter turn and the first batch were not quite as thin as the bought pastry but would be perfect as dumpling dough.